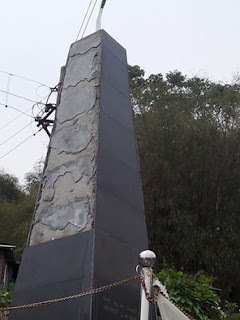 The Gorkha Jan Mukti Morcha Kalimpong Branch committees have given a 5 days ultimatum to Police administration in demand with the arrest of culprit in Martyr Mangal Singh Memorial damage case. Today GTA Deputy Chief Rtd Col Ramesh Allay, Nordhen Lama President of GJM Kalimpong, Secreatary Kumar Chamling, Sabhasad Nima Tamang , Sarita Rai along with leader from Women’s and Youth wing submitted a memorandum to Kalimpong PS OC. Nordhen Lama speaking with the press told that the Police have not been successful in finding not a single Clue as of now. We are hurt by the incident done by anti social and those against Gorkhaland. We have given them ultimatum failing which we will do a program of Chakka Jam in Hills he added. 0 Respones to "GJMM shoots ultimatum for action in Rajput Memorial vandalism case"